The Boothbay Harbor Oceanside Golf Resort offers inviting coastal accommodations. 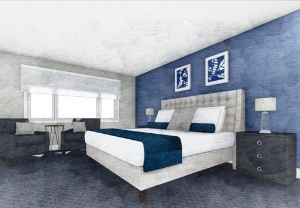 We have 91 rooms and suites that have all been newly renovated and refreshed with all new furnishings, king size beds and five star luxury linens. Enjoy incredible harbor views of beautiful Boothbay Harbor – a quintessential coastal Maine town from your balcony. You’ll also see some of the most spectacular sunsets from our perfect easterly vantage point. We look forward to welcoming you to our Oceanside Resort! Our bright, spacious rooms & suites all offer a private bath, flat screen TVs, cable and free WiFi. Our Suites offer the most spacious option with a separate seating area and the most desired amenities. Our Water View Suites offer the most spacious option with a separate seating area and a view our picturesque harbor. All of our guest rooms and suites have been completely refreshed with all new furnishings, king size beds and five star luxury linens. Our Suites offer our guests the most spacious option with a separate seating area. All of our guest rooms and suites have been completely refreshed with all new furnishings, king size beds and five star luxury linens. All Rooms and Balconies are Non-Smoking. If cancelled up to 3 days before date of arrival, a fixed amount of $25 will be charged. If cancelled less than 3 days prior to arrival, or in case of no-show, 100 percent of the first night will be charged.